Although it feels (and smells) as if it just began, chile-roasting season will soon be over in Artesia. 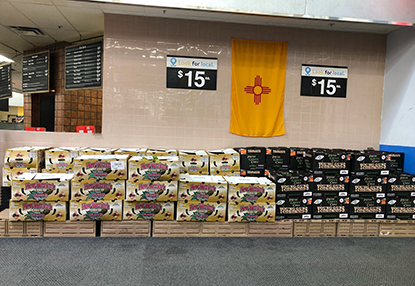 The boxes pictured above represent the last of Wal-Mart’s crop for 2018. The store will not be ordering more chiles for roasting once their current supply is gone. Roasting is available until 8 p.m. upon customer request. Meanwhile at Fenn’s Country Market, roasting will continue for two to three more weeks and takes place upon customer request during regular store hours Mondays, Wednesdays, Fridays and Saturdays.